Gripping Range: 0" - 3/4"
When another pair of hands isn't available to grip, lift or carry large sheet and board materials, the Foster Gorilla Gripper GP can help. This simple device also minimizes or eliminates damage to the edges and corners of large sheets of rigid substrates, saving your shop money and frustration. Simply slip the Gorilla Gripper over the center of the panel and lift. Carry panels with less fatigue, increased control and unobstructed field of vision, plus reduce potential injuries to fingers, hands, wrists and backs. The Gorilla Gripper GP is made of high-strength, aircraft-grade aluminum and its guaranteed lifting capability is 200lbs with a gripping range of 0" to 3/4" (0 to 21mm). Plus, it can lift large sheets of substrates such as acrylic, aluminum composite, drywall,glass,MDF,plywood and PVC. This Foster Gorilla Gripper GP is backed by a limited lifetime warranty. Item works as advertise, takes some getting use to initially. Even used with 12' drywall and it made moving them around a 1 person job. Introducing ? 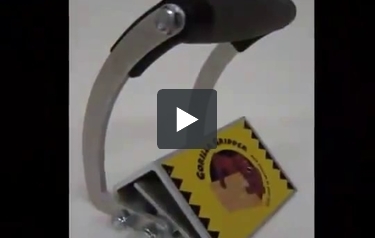 Gorilla Gripper. Add muscle to your grip. This is a 3/4" sheet of plywood. To move it, you grip it with your hands, get your foot underneath it, bend down, pick it up. Just like that. Well, that's the old way of lifting [inaudible 00:00:22]. The new way is with the Gorilla Gripper. Place it over the top, lift with a straight back ? it's that simple. This is a 3/4" plywood. This is the Gorilla Gripper. That simple. www.gorillagripper.com.